This article may require cleanup to meet this wiki's standards. You can help out by re-organizing or re-writing parts of it or checking grammar and spelling. Yu-Gi-Oh! 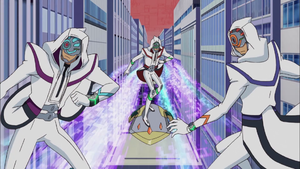 VRAINS episode 1: "Link into the VRAINS"
The Knights of Hanoi (ハノイの騎（き）士（し） Hanoi no Kishi) are a mysterious hacker group that hacks via Dueling inside LINK VRAINS. They appear as the main antagonists in the first season of the Yu-Gi-Oh! VRAINS anime. Their goal is to destroy the "AI World" known as "Cyberse" that exists somewhere in the depths of the Network. The Knights of Hanoi are an organization of hackers led by Varis, with the top-ranking Knights consisting of researchers who played a part in the Hanoi Project. The Knights all use a mostly white uniform with lines of differing colors in some parts of the uniform. On top of it, they wear a hooded white coat that covers their body and reaches the back of their knees, with the rank-and-file members of the organization also wearing masks. This is probably just their preferred Avatar on LINK VRAINS, used to hide their true appearances. The organization's higher ranking members do not wear hoods, revealing their faces, but wear clothing similar in style to the rank-and-file. Additionally, the Duel Disks used by the members are differentiated between the ranks, with the grunts using Duel Disks that are silver-bordered and green, the lieutenants using those that are silver-bordered and yellow, while Varis uses one that is gold-bordered and red. The Knights of Hanoi utilize "Cracking Dragon" to assault the digital world with its power. Individuals who fall victim to this mechanical dragon while in LINK VRAINS have their accounts deleted from the system. Five years before the start of the series, Varis assaulted "Cyberse" with "Cracking Dragon" with the intention to destroy it. The different Artificial Intelligences that protected it were restrained by Varis and thus unable to stop the destruction of their world. However the Ignis Ai appeared and forced a disconnection of the Cyberse World from the rest of the network, thus forcing Varis out of Cyberse while keeping its location known only to him. However, Varis, furious by Ai's interference, ordered his "Cracking Dragon" to capture Ai, which led to the AI to be dismembered by the monster's jaws. This made Varis and the Knights of Hanoi spend the following years searching for Ai's parts in order to find the location of Cyberse. At some point, the Knights of Hanoi hunted down the Cyberse monsters and destroyed a significant amount of them to the point Varis was confident they were extinct. Five years later, the Knights of Hanoi continued their search of Ai; but had many of their operations interrupted by the mysterious Duelist Playmaker, who defeated their agents, earning a name for himself. Spectre, the Knights' second-in-command, informed Varis that a trace of Ai was detected and that SOL Technologies was in pursuit. Knowing that if SOL retrieved Ai, they would be able to restore Cyberse and ruin the Knights' efforts, forcing the Knights to act. Spectre informed Varis about Playmaker, who had interfered with them before. Varis wondered if Playmaker was a member of SOL, but dismissed the possibility as they would act more publicly. Spectre added that Playmaker erased every trace of his activity and eluded the Knights' searches, concluding that whoever he is he must be a skilled hacker. Varis became interested in Playmaker, but decided to leave him for now as Ai was their priority. While SOL Technologies performed a city scan in order to search for Ai, the Knights of Hanoi decided to attack as the defenses of VRAINS would be left vulnerable at that point. Varis ordered his men to search for Ai, assaulting the digital world with their "Cracking Dragons" and ravaging the users in their way, deleting their accounts in the process. Ai's remnants in the form of an eye was swiftly cornered by the Knights until Yusaku Fujiki and Kal Kolter used the lowered defenses to create an alternative path for Ai, who used the newly made escape route, but ended up in Yusaku's Duel Disk as a result. Yusaku entered VRAINS using his persona Playmaker, saving the Celebrity Duelist Blue Angel at the nick of time before she was deleted. Yusaku then confronted a Knight of Hanoi who told him that the AI they were looking for was on his Duel Disk and threatened to delete it if they did not cease their attack. Since Ai was bonded to Yusaku's Duel Disk, the Knights must defeat Playmaker in a Duel in order to obtain it. Varis, watching from afar, was amused at Playmaker while the Knights' agent accepted the challenge. Ai estimated that Yusaku's current Deck was not enough to defeat the Knight's "Cracking Dragon". He caused a Data Storm and instructed Yusaku to ride the wind and enter a Speed Duel. Ai taught Yusaku the rules of Speed Duels. The Knight of Hanoi quickly Summoned his "Cracking Dragon", which he used for the remainder of the Duel, exploiting its abilities to avoid destruction and inflict effect damage, and further exacerbating his advantage through the Skill "Double Draw" which let him draw two cards during his Draw Phase. Ai realized they must have hacked the system as the Skill was not known to him. Although Yusaku fared decently against the Knight of Hanoi, his LP was on critical state so Ai instructed him to take a path where he was engulfed in a massive storm. Inside the tempest, Ai told Yusaku that his LP was low enough to use the Skill "Storm Access" to gain a powerful monster. Yusaku did so and was able to acquire "Decode Talker" and Link Summon it. Through a combination of "Cyberse Wizard" and "Decode Talker", he was able to exploit the low DEF of "Cracking Dragon" and inflict piercing damage as a result of "Decode Talker" gaining ATK through its own effect, and due to being unable to be in Defense Position, it bypassed the Knight's "Pulse Mines", defeating the Knight. Playmaker subsequently attempted to interrogate the Knight, who started a self-destruction mechanism in response before Ai suddenly deleted him from the system to protect himself and Playmaker. Spectre and Varis discussed the events of the Duel with Playmaker. Varis preferred Playmaker having his hands on Ai for a while over SOL Technologies having him, but added they should not leave him with Playmaker for too long. He them summed up a list of characteristics of Playmaker's that might help discover his true identity, one of these being that Playmaker would eventually want to Duel him. Varis briefly logged out of LINK VRAINS to visit his father. The Knights of Hanoi eventually turned their attention to Blue Angel, as she openly challenged Playmaker to a Duel in public. Spectre, confident they could use her, approached her claiming to be a fan. He gave her "Dark Angel" and disappeared, with Blue Angel having a vague recollection of what happened. Ai lured Playmaker into facing Blue Angel after sensing Hanoi's presence on her. Playmaker accepted her challenge intending to investigate her. The Duel began and Blue Angel punished Playmaker repeatedly with the effect damage combo from her "Trickstar" cards forcing Playmaker to the defensive, although she later discovered it was his plan all along in order to use his Storm Access Skill. Varis watched from afar, confident that once Blue Angel used "Dark Angel" she would be unable to disobey them. Blue Angel attempted to defeat Playmaker using her Skill "Trickstar Trick" in order to force Playmaker to draw cards and inflict game-ending damage, but he prevented this by using "Defect Compiler" to nullify the damage. With little resources left, Blue Angel resorted to using "Dark Angel", which had a severe effect on her. Playmaker rapidly used a combination of "Encode Talker", "Defect Compiler", and "Frontline Disturbance" to increase the ATK of "Encode Talker" and weaken that of "Trickstar Holly Angel" in order to defeat Blue Angel with a single attack. Playmaker Dueled Varis for the cure to Blue Angel's Virus and had a DRAW in their first encounter. However, a rematch occurred afterwards which Playmaker won. He obtained the cure and freed Blue Angel. Hanoi then started a phenomenon known as the Deleted to find Playmaker. 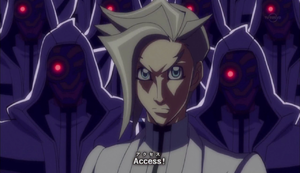 A virus which takes people inside of LINK VRAINS unwillingly and makes them unable to log out. They use the same parameters as Playmaker to hunt him down. Each one uses an old-style Duel Disk, they are all talented Duelists and they are all hackers. Once taken into LINK VRAINS, Dr. Genome puts them in a coma. Varis later appeared in the Knights base and showed annoyance that the data on the Hanoi Project data would be erased and Varis would never know Playmaker's identity. Kogami appeared on a holoscreen and said that the plan was coming together and questioned Varis's "long face". Varis said he couldn't move on until he beat Playmaker. Kogami seemed to understand his desire but said his plan couldn't wait long. Three Knights of Hanoi attack innocent Duelists. Hanoi later attacked LINK VRAINS and some duelists who refused to Duel them. However the Knights used a program to force them to duel. Each of the Duelists were defeated by Hanoi. Varis, who watched the action nearby, stated that over a thousand joined the Knights but they were mostly "hoodlums" and that they only joined Hanoi for self-promotion and their opposition to LINK VRAINS. Faust and Baira then appeared and stated that the "hoodlums" were tarnishing their reputation and said that it was time to carry out Kogami's wishes. After the Knights had attacked the Duelists, the Gore appeared, disguised as Playmaker, and easily defeated them without needing to Duel. Dr. Genome later appeared and knew that Gore was in disguise, the two then commenced a Speed Duel with Genome using another program, the Data Gale. Unlike henchman Duelists of past series, such as Diablo or the Obelisk Force, the regular Knights of Hanoi members don't appear to all use identical Decks. While their Decks differ between members, their strategies appear similar: to quickly Summon DARK-Attribute monsters with high ATK in order to overwhelm their opponents. ↑ 1.0 1.1 1.2 1.3 1.4 Yu-Gi-Oh! VRAINS episode 1: "Link into the VRAINS"
↑ Yu-Gi-Oh! VRAINS episode 2: "Seize the Wind!" ↑ 3.0 3.1 Yu-Gi-Oh! VRAINS episode 3: "Contact"
↑ Yu-Gi-Oh! VRAINS episode 6: "True Blue"
↑ Yu-Gi-Oh! VRAINS episode 7: "Fallen Angel"
↑ Yu-Gi-Oh! VRAINS episode 9: "Malicious Mayhem"
↑ Yu-Gi-Oh! VRAINS episode 10: "Eye of the Storm"
↑ Yu-Gi-Oh! VRAINS episode 11: "Neutralized"
↑ Yu-Gi-Oh! VRAINS episode 12: "Link the Circuit"
↑ Yu-Gi-Oh! VRAINS episode 20: "A Piece of the Puzzle"
↑ 11.0 11.1 11.2 Yu-Gi-Oh! VRAINS episode 22: "The Deleted"
This page was last edited on 1 February 2019, at 03:55.